Videos influence your users to purchase more. Ok, so I haven’t told you anything new. Have I? Internet is flooded with lots of gyan on ‘why video is future of marketing’ or ‘why you should include video in your content strategy’ etc etc. But no one is telling you the practical operational nuances, right? So, the idea of writing this article is not to tell you about the importance of video or video marketing or video marketing trends or any stuff like that but things you should be knowing as an Organization/ Company/ Marketer/ Digital Marketer to create an effective/ awesome/ viral video easily, quickly and most importantly in the right price. How to create video easily, quickly and at the right price? 1. What is the objective of your video? It is extremely important to understand why you want a video at first place. This “why” answers lot of questions like – CTA, marketing communication etc. Do you have a rough script or concept or reference video in mind based on your value proposition or marketing communication? Do you want a Live Shoot Video, or an Animation Video, or a mix of both? 4. Are you making the video for Facebook or Youtube or for any specific platform? There is a huge difference between a Facebook video and a Youtube video. You must be clear how and where you would like to distribute your video. Longer is not always bad and shorter is not always good. It all depends on your objective, platform, audience etc. If you are a startup or low on budget, you could also help video creators with models, voice over artists etc. to reduce the cost. You can tell them that upfront or discuss this with them. Once the script is finalized, both the parties sign a contract or service agreement. The Video Creator takes 50% advance and starts the video production. The Video Creator submits the first draft of the video. After incorporating all the feedback, the Video Creator completes and delivers the final video. An explainer video is a short, animated video that explains your product to your customers in a very simplified manner. You can also create a product pitch with the help of these explainer videos. These are normally animation videos but could be a mix of Live shoot and graphics as well. We do not need to tell you that, right? All the ads you watch on tv or youtube which increase the brand recognition or product promotion. The name is enough. With digital became a world in itself, viral videos became prominent for promoting a product/ service to netizens. Several factors are responsible for making a video viral. It can be the face value of the influencer in the video, your promotion strategy, launch timing, a relation with controversy or emotional content. Corporate Video is nothing but making an audio video presentation of your company than a normal powerpoint presentation. The idea is to let all the stakeholders know about the company’s history, growth, plans etc. Product videos are made to highlight and demonstrate a new innovative product and its features. These are generally a mix of live shoot and graphics. A video has many elements which decide the quality of a video, hence the differences in pricing. A video on the same concept can be made with Rs. 20,000 and also with Rs. 2 lakh. Concept (or Script) is king in any video unless Salman Khan is acting in it 😛 . Jokes apart, video is a creative audio visual entity and more than half of the work is done if you have a good concept/script in hand. A good creative concept could definitely help your audience to understand your product/ service/ value proposition/ brand proposition, help them in recalling your company and hence help you in achieving the business objective. Anything which is executed intuitively can work and this is completely valid for videos as well. It’s not that animation is better than live shoot or vice versa or Short videos are better than Long videos so on and so forth. We can tell you exception for every rule you suggest. So, it’s more about understanding your audience, marketing communication and then create a video which can creatively delivers your message. But the question is – Is finding video creators solve the problem? So you got profiles of 10 video creators, will you be able to identify the ‘best fit’ or right service provider who can create a video that would lead to your business objective? 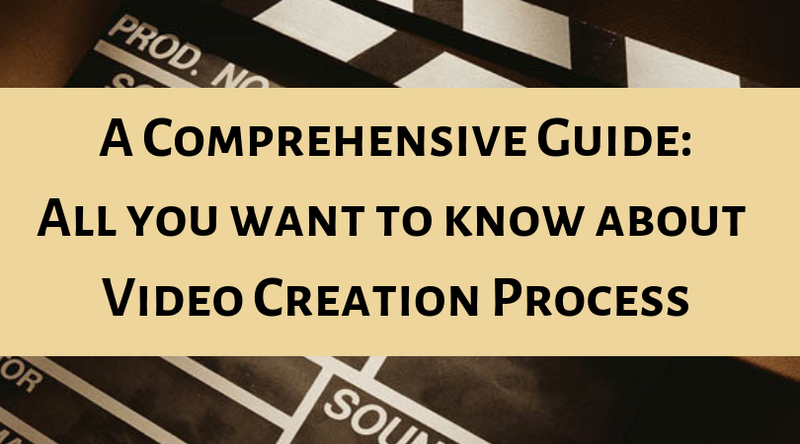 Do you have “defined selection parameters” for selecting a video creator? Like on what basis you will finalise a vendor? Can you differentiate one video creator’s work from other? Also, there are many things like quality, price of video etc you need to figure out before you make a decision. Trust me more you speak with vendors, more confusion you will have. Video is a complex entity which requires creativity as well as technical skills. As a company/ Organization we want to outsource it because it requires specific skills sets like cinematography, editing, script writing, sound, acting etc. which we do not have inhouse. You will then finalise a service provider who you think (and pray) can deliver the desired quality on time on parameters like Price etc. How to get video creation done easily, quickly and in right price? What is an estimate price of your video requirement and what are the variables involved in calculating the price? What kind of video should I make to fulfil my business objective? What would be the optimized project scope as per my budget? Based on what parameters, we should select a fit vendor? How to ensure committed deliverable quality and timelines? How to ensure a smooth project management? We at Vidsaga.com have developed a platform (for all the above problems) through which we can help you at every stage of video creation journey. We do not charge any commission from the video creator and also there is no fees involved for posting the project. So the Organizations get the best price everytime that too easily and quickly. To grow your business, leverage the power of video submit your requirement now. Submit your video requirement here. 9 Things To Keep In Mind Before Choosing A Corporate Video Production Company.